5 drawings on paper : ink ; 9.5 x 6 in. Ink sketches of five men identified by inscriptions. 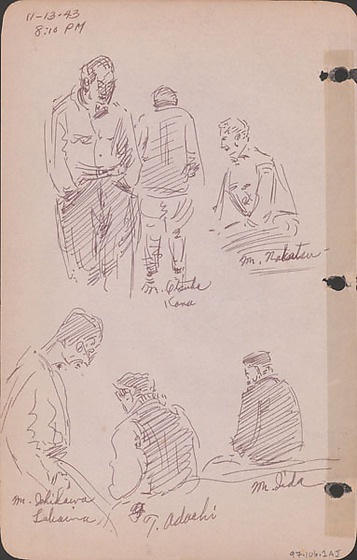 Top row, top left sketches appear to be front and back views of Mr. Otsuka of Kona, Hawaii with hands in pockets ; right sketch of Mr. Nakatsu, a seated man in profile. Bottom row sketch of Mr. Ishikawa of Lahaina, Maui standing in profile right with hands in pockets leaning against wall ; T. Adachi sits with back to viewer, center ; Mr. Iida is seated with back to viewer on right. Drawing 97.106.1AI is on recto of same sheet. Written in black ink, top left corner: 11-13-43 / 8:10PM. Written in black ink next to individual sketches: [top row] Mr. Otsuka / Kona, Mr. Nakatsu ; [bottom row] Mr. Ishikawa / Lahaina, T. Adachi, Mr. Iida.